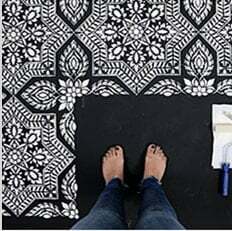 Beautiful Mandala stencils for walls, floors and furniture! Our large Mandala stencils are so much better than vinyl mandala decals. Create beautiful hand-painted designs using our Mandala stencils! With reusable stencils, you can easily paint colorful, unique mandalas on any surface in your home. We have stenciled mandalas on decks, floors, walls and ceilings, especially around the light fixture. We even made one-of-a-kind tie-dye mandala tapestries and mandala tote bags! Mandalas represent the Cosmos, the Universe, the Self and the Circle of Life. These beautiful circular designs bring a sense of peace and harmony into one's space and help to re-organize and deepen one's inner life. Stenciling a mandala can become a calming, meditative experience that encourages your creativity and focus. Each mandala stencil design is created in various sizes to perfectly fit your DIY project. Do you want to learn How to stencil? Which tools and supplies to use for stenciling? We have answers for you, just watch our How To Stencil Videos packed full of stenciling tips, tricks and inspiration.